Venerable Dr Juewei is an active member of the Fo Guang Shan Buddhist order. She has held many international positions within the order’s University Consortium and Temples, including University of the West and Hsi Lai Temple in California, USA, and Australia’s Nan Tien Temple. She is now Associate Lecturer, Special Assistant and Director, Humanistic Buddhism Centre at NTI. best practice implementation. 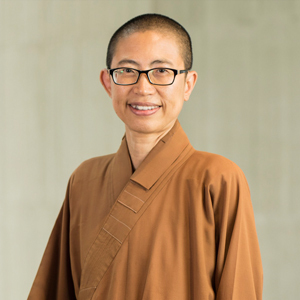 Venerable Dr Juewei holds a PhD in Religious Studies, and is heading a worldwide tour entitled ‘Buddha’s Birthday Education Project – Through These Doors: Connecting Past and Present, East and West’ based on her Dissertation. She also holds a Masters in Buddhist Studies from Tsung-Lin Buddhist College in Taiwan. 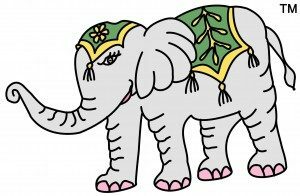 Our logo playfully depicts the yellow-white, 6-tusked elephant that appeared to Queen Maya in a dream. She thereafter bore Prince Siddhārtha who matured to become Śākyamuni Buddha, the founder and spiritual leader of Buddhism. Sam is not a random elephant. He is taken from an Eastern Han tombstone -- and we believe that he is one of the earliest representations of Buddha's birthday celebrations in China. Sam is a stylised and modern version of this historic emblem. “Sara" is Sam’s companion, is shown as a helper elephant in our triptych mural. AND… the adorable Baby Karma! Professor Lancaster is the Buddha’s Birthday Education Project (BBEP) research advisor. Professor Lewis Lancaster, a distinguished scholar of Buddhism, founded the Electronic Cultural Atlas Initiative to use the latest computer technology to map the spread of various strands of Buddhism from the distant past to the present. Professor Lancaster has published over 55 articles and reviews and has edited or authored numerous books including Prajnaparamita and Related Systems, The Korean Buddhist Canon, Buddhist Scriptures, Early Ch’an in China and Tibet, and Assimilation of Buddhism in Korea. He is Emeritus Professor of the Department of East Asian Languages at the University of California, Berkeley, USA, and has served as President, Adjunct Professor and Chair of the dissertation committee at University of the West since 1992. He was also the Chair of Buddhist Studies at UC, Berkeley, USA and Editor of the Berkeley Buddhist Studies Series.